^ 1.0 1.1 Silver & Ursini, The Vampire Film, pp. 22-23. ^ J. Simpson, E. Weiner (eds) (编). Vampire. Oxford English Dictionary 2nd. Oxford: Clarendon Press. 1989. ISBN 0-19-861186-2. ^ Vermeir, K.（2012）. Vampires as Creatures of the Imagination: Theories of Body, Soul, and Imagination in Early Modern Vampire Tracts（1659–1755）. In Y. Haskell（Ed.）, Diseases of the Imagination and Imaginary Disease in the Early Modern Period. Turnhout: Brepols Publishers. ^ 5.0 5.1 5.2 Barber, p. 5. ^ Deutsches Wörterbuch von Jacob Grimm und Wilhelm Grimm. 16 Bde.（in 32 Teilbänden）. Leipzig: S. Hirzel 1854–1960. [2006-06-13]. （原始内容存档于2007-09-26） （德语）. ^ Vampire. Merriam-Webster Online Dictionary. [2006-06-13]. （原始内容存档于2006-06-14）. ^ Trésor de la Langue Française informatisé. [2006-06-13]. （原始内容存档于2012-05-26） （法语）. ^ Dauzat, Albert. Dictionnaire étymologique de la langue française. Paris: Librairie Larousse. 1938. OCLC 904687 （法语）. ^ Weibel, Peter. Phantom Painting – Reading Reed: Painting between Autopsy and Autoscopy. David Reed's Vampire Study Center. [2007-02-23]. （原始内容存档于2007-09-27）. ^ Dragana Jovanović. Vampire Threat Terrorizes Serbian Village. ABC News. 2012-11-29 [2012-12-03]. ^ 13.0 13.1 Russian Etymological Dictionary by Max Vasmer. [2006-06-13] （俄语）. ^ （保加利亚文）Mladenov, Stefan (1941). Etimologičeski i pravopisen rečnik na bǎlgarskiya knižoven ezik. ^ Рыбаков Б.А. Язычество древних славян / М.: Издательство 'Наука,' 1981 г.. [2007-02-28] （俄语）. ^ Зубов, Н.И. Загадка Периодизации Славянского Язычества В Древнерусских Списках "Слова Св. Григория ... О Том, Како Первое Погани Суще Языци, Кланялися Идолом...". Живая Старина. 1998, 1 (17): 6–10 [2007-02-28]. （原始内容存档于2007-02-25） （俄语）. ^ 20.0 20.1 Barber, p. 2. ^ 22.0 22.1 22.2 Reader's Digest Association. Vampires Galore!. The Reader's Digest Book of strange stories, amazing facts: stories that are bizarre, unusual, odd, astonishing, incredible ... but true. London: Reader's Digest. 1988: 432–433. ISBN 0-949819-89-1. ^ Lawson, John Cuthbert. Modern Greek Folklore and Ancient Greek Religion. Cambridge: Cambridge University Press. 1910: 405–06. ISBN 0-524-02024-8. OCLC 1465746. ^ 26.0 26.1 Jaramillo Londoño, Agustín. Testamento del paisa 7th. Medellín: Susaeta Ediciones. 1986 . ISBN 958-95125-0-X （西班牙语）. ^ 31.0 31.1 Barber, pp. 114–15. ^ 32.0 32.1 Barber, p. 96. ^ Mappin, Jenni. Didjaknow: Truly Amazing & Crazy Facts About... Everything. Australia: Pancake. 2003: 50. ISBN 0-330-40171-8. ^ 37.0 37.1 Spence, Lewis. An Encyclopaedia of Occultism. New Hyde Parks: University Books. 1960. ISBN 0-486-42613-0. OCLC 3417655. ^ 38.0 38.1 Silver & Ursini, p. 25. ^ 39.0 39.1 Barber, p. 73. ^ Alseikaite-Gimbutiene, Marija. Die Bestattung in Litauen in der vorgeschichtlichen Zeit. Tübingen. 1946. OCLC 1059867 （德语）. （thesis）. ^ Vukanović, T.P. The Vampire. Journal of the Gypsy Lore Society. 1959, 38: 111–18. ^ Klapper, Joseph. Die schlesischen Geschichten von den schädingenden Toten. Mitteilungen der schlesischen Gesellschaft für Volkskunde. 1909, 11: 58–93 （德语）. ^ Löwenstimm, A. Aberglaube und Stafrecht. Berlin. 1897: 99 （德语）. ^ Bachtold-Staubli, H. Handwörterbuch des deutschen Aberglaubens. Berlin. 1934–35 （德语）. ^ Filipovic, Milenko. Die Leichenverbrennung bei den Südslaven. Wiener völkerkundliche Mitteilungen. 1962, 10: 61–71 （德语）. ^ Greenfieldboyce, Nell. Scientists Analyze Skeletal Remains From Vampire Graveyard. NPR. 2014-11-27 [2015-03-08]. ^ McNally, Raymond T.; Florescu, Radu. In Search of Dracula. Houghton Mifflin. 1994: 117. ISBN 0-395-65783-0. ^ Burton, Sir Richard R. Vikram and The Vampire:Classic Hindu Tales of Adventure, Magic, and Romance. London: Tylston and Edwards. 1893  [2007-09-28]. ISBN 0-89281-475-6. ^ 58.0 58.1 Hurwitz, Lilith. ^ Shael, Rabbi. Rabbi Shael Speaks...Tachles: Vampires, Einstein and Jewish Folklore. Shaelsiegel.blogspot.com. 2009-06-01 [2010-12-05]. ^ Graves, Robert. The Empusae. The Greek Myths. London: Penguin. 1990: 189–90 . ISBN 0-14-001026-2. ^ Oliphant, Samuel Grant. The Story of the Strix: Ancient. Transactions and Proceedings of the American Philological Association. 1913-01-01, 44: 133–49. ISSN 0065-9711. JSTOR 282549. doi:10.2307/282549. ^ William of Newburgh; Paul Halsall. Book 5, Chapter 22–24. Historia rerum Anglicarum. Fordham University. 2000 [2007-10-16]. ^ Ármann Jakobsson (2009). "The Fearless Vampire Killers: A Note about the Icelandic Draugr and Demonic Contamination in Grettis Saga". Folklore 120: 307–316; p. 309. ^ Klinger, Leslie. Dracula's Family Tree. The New Annotated Dracula. New York: W.W. Norton & Company, Inc. 2008: 570. ISBN 978-0-393-06450-6. ^ Pile, Steve. Dracula's Family Tree. Real cities: modernity, space and the phantasmagorias of city life. London: Sage Publications Ltd. 2005: 570. ISBN 0-7619-7041-X. ^ Caron, Richard. Dracula's Family Tree. Ésotérisme, gnoses & imaginaire symbolique: mélanges offerts à Antoine Faivre. Belgium: Peteers, Bondgenotenlaan 153. 2001: 598. ISBN 90-429-0955-2. ^ Marigny, Jean. 第二章：教會承認惡靈存在—吸血鬼迷信在東歐. 《吸血鬼：暗夜裡尋找生命》. 發現之旅. 21. 吳岳添/譯. 臺北: 時報文化. 1995年8月15日: 第39–40頁. ISBN 957-13-1724-1 （中文（台灣）‎）. ^ 72.0 72.1 Barber, pp. 5–9. ^ 73.0 73.1 Barber, pp. 15–21. ^ Voltaire. Philosophical Dictionary. Penguin. 1984 . ISBN 0-14-044257-X. ^ Lambertini, P. XXXI. De servorum Dei beatificatione et sanctorum canonizatione. Pars prima. 1749: 323–24. ^ de Ceglia F.P. The Archbishop’s Vampires. Giuseppe Davanzati’s Dissertation and the Reaction of Scientific Italian Catholicism to the Moravian Events. Archives internationals d’histoire des sciences. 2011, 61 (166/167): 487–510. ^ Martinez Vilches, Oscar. Chiloe Misterioso: Turismo, Mitologia Chilota, leyendas. Chile: Ediciones de la Voz de Chiloe. 1992: 179. OCLC 33852127 （西班牙语）. ^ 83.0 83.1 Sledzik, Paul S.; Nicholas Bellantoni. Bioarcheological and biocultural evidence for the New England vampire folk belief (PDF). American Journal of Physical Anthropology. 1994, 94 (2): 269–274 [2007-12-30]. PMID 8085617. doi:10.1002/ajpa.1330940210. （原始内容 (PDF)存档于2003-10-04）. ^ Interview with a REAL Vampire Stalker. SeacoastNH.com. [2006-06-14]. ^ Bunson, Vampire Encyclopedia, pp. 23–24. ^ Hearn, Lafcadio. Kwaidan: Stories and Studies of Strange Things. Boston: Houghton, Mifflin and Company. 1903. ISBN 0-585-15043-5. ^ Ramos, Maximo D. Creatures of Philippine Lower Mythology. Quezon: Phoenix Publishing. 1990 . ISBN 971-06-0691-3. ^ Stephen, Michele. Witchcraft, Grief, and the Ambivalence of Emotions. American Ethnologist. 1999, 26 (3): 711–737. doi:10.1525/ae.1999.26.3.711. ^ Suckling, Nigel. Vampires. London: Facts, Figures & Fun. 2006: 31. ISBN 1-904332-48-X. ^ 劉, 天賜. 僵屍與吸血鬼. Hong Kong: Joint Publishing（H.K.）. 2008: 196. ISBN 978-962-04-2735-0. ^ de Groot, J.J.M. The Religious System of China. E.J. Brill. 1910. OCLC 7022203. ^ Lam, Stephanie. Hop on Pop: Jiangshi Films in a Transnational Context. CineAction. 2009, (78): 46–51. ^ Hudson, Dave. Draculas, Vampires, and Other Undead Forms. Rowman & Littlefield. 2009: 215. ISBN 978-0-8108-6923-3. ^ Tenthani, Raphael. 'Vampires' strike Malawi villages. BBC News. 2002-12-23 [2007-12-29]. ^ Manchester, Sean. The Highgate Vampire: The Infernal World of the Undead Unearthed at London's Highgate Cemetery and Environs. London: Gothic Press. 1991. ISBN 1-872486-01-0. ^ Jeffries, Stuart. Reality Bites. The Guardian (London). 2005-01-18 [2007-12-29]. ^ Stephen Wagner. On the trail of the Chupacabras. [2007-10-05]. ^ Taylor T. The real vampire slayers. The Independent (London). 2007-10-28 [2007-12-14]. ^ Hume, L., & Kathleen Mcphillips, K.（Eds.）。（2006）. Popular spiritualities: The politics of contemporary enchantment. Burlington, Ashgate Publishing. ^ Young, T. H. Dancing on Bela Lugosi's grave: The politics and aesthetics of Gothic club dancing. Dance Research. 1999, 17 (1): 75–97. JSTOR 1290878. ^ Belanger, Michelle. Vampires in Their Own Words: An Anthology of Vampire Voices. Woodbury MN: Llewellyn Worldwide. 2007: 118. ISBN 978-0-7387-1220-8. OCLC 245535068. ^ Malki, David. Wondermark » Archive » #566; Supernatural Collective Nouns.. UNDEAD CLASS. 2009-10-30. A basement of vampires. ^ Barber, Paul. Staking Claims: The Vampires of Folklore and Fiction. Skeptical Inquirer. March–April 1996, 20 (2) [2015-06-29]. ^ 114.0 114.1 Barber, p. 119. ^ Adams, Cecil. Did vampires suffer from the disease porphyria—or not?. The Straight Dope. Chicago Reader. 1999-05-07 [2007-12-25]. ^ Pierach, Claus A. Vampire Label Unfair To Porphyria Sufferers. Opinion. 1985-06-13 [2007-12-25]. 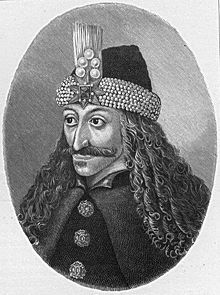 ^ Kujtan, Peter W. Porphyria: The Vampire Disease. The Mississauga News online. 2005-10-29 [2009-11-09]. ^ Gómez-Alonso, Juan. Rabies: a possible explanation for the vampire legend. Neurology. 1998, 51 (3): 856–9. PMID 9748039. doi:10.1212/WNL.51.3.856. ^ Rabies-The Vampire's Kiss. BBC news. 1998-09-24 [2007-03-18]. ^ Jones, Ernest. The Pathology of Morbid Anxiety. Journal of Abnormal Psychology. 1911, 6 (2): 81–106. PMID 17296997. doi:10.1037/h0074306. ^ Glover, David. Vampires, Mummies, and Liberals: Bram Stoker and the Politics of Popular Fiction. Durham, NC. : Duke University Press. 1996. ISBN 0-8223-1798-2. ^ An extensive discussion of the diffenrent uses of the vampire metaphor in Marx's writings can be found in Policante, A. "Vampires of Capital: Gothic Reflections between horror and hope" 页面存档备份，存于互联网档案馆 in Cultural Logic 页面存档备份，存于互联网档案馆, 2010. ^ Brass, Tom. Nymphs, Shepherds, and Vampires: The Agrarian Myth on Film. Dialectical Anthropology. 2000, 25 (3/4): 205–237. doi:10.1023/A:1011615201664. ^ Linnell, Stig. Stockholms spökhus och andra ruskiga ställen. Raben Prisma. 1993 . ISBN 91-518-2738-7 （瑞典语）. ^ Skal (1993) pp. 342–43. ^ Jon, A. Asbjorn. The Psychic Vampire and Vampyre Subculture. Australian Folklore. 2002, (12): 143–148. ISSN 0819-0852. ^ 139.0 139.1 139.2 139.3 Cohen, pp. 95–96. ^ Cooper, J.C. Symbolic and Mythological Animals. London: Aquarian Press. 1992: 25–26. ISBN 1-85538-118-4. ^ Heraldic "Meanings". American College of Heraldry. [2006-04-30]. Barber, Paul. 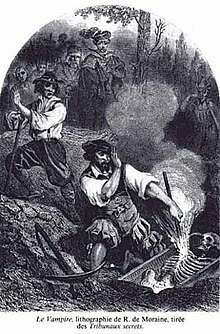 Vampires, Burial and Death: Folklore and Reality. New York: Yale University Press. 1988. ISBN 0-300-04126-8. Bunson, Matthew. The Vampire Encyclopedia. London: Thames & Hudson. 1993. ISBN 0-500-27748-6. Burkhardt, Dagmar. 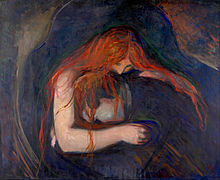 Vampirglaube und Vampirsage auf dem Balkan. Beiträge zur Südosteuropa-Forschung: Anlässlich des I. Internationalen Balkanologenkongresses in Sofia 26. VIII.-1. IX. 1966. Munich: Rudolf Trofenik. 1966. OCLC 1475919 （德语）. Cohen, Daniel. Encyclopedia of Monsters: Bigfoot, Chinese Wildman, Nessie, Sea Ape, Werewolf and many more.... London: Michael O'Mara Books Ltd. 1989. ISBN 0-948397-94-2. Créméné, Adrien. La mythologie du vampire en Roumanie. Monaco: Rocher. 1981. ISBN 2-268-00095-8 （法语）. Faivre, Antoine. Les Vampires. Essai historique, critique et littéraire. Paris: Eric Losfeld. 1962. OCLC 6139817 （法语）. Féval, Paul. Les tribunaux secrets : ouvrage historique. Paris: E. et V. Penaud frères. 1851–1852 （法语）. Frayling, Christopher. Vampyres, Lord Byron to Count Dracula. London: Faber. 1991. ISBN 0-571-16792-6. Hoyt, Olga. The Monk's Investigation. Lust for Blood: The Consuming Story of Vampires. Chelsea: Scarborough House. 1984. ISBN 0-8128-8511-2. Introvigne, Massimo. La stirpe di Dracula: Indagine sul vampirismo dall'antichità ai nostri giorni. Milan: Mondadori. 1997. ISBN 88-04-42735-3 （意大利语）. Hurwitz, Siegmund. Gela Jacobson（trans.）, 编. Lilith, the First Eve: Historical and Psychological Aspects of the Dark Feminine. Einsiedeln, Switzerland: Daimon Verlag. 1992 . ISBN 3-85630-522-X. Jennings, Lee Byron. An Early German Vampire Tale: Wilhelm Waiblinger's 'Olura'. (编) Reinhard Breymayer and Hartmut Froeschle (eds.). In dem milden und glücklichen Schwaben und in der Neuen Welt: Beiträge zur Goethezeit. Stuttgart: Akademischer Verlag Stuttgart. 2004: 295–306 . ISBN 3-88099-428-5. Jones, Ernest. The Vampire. On the Nightmare. London: Hogarth Press and Institute of Psycho-Analysis. 1931. ISBN 0-394-54835-3. OCLC 2382718. Marigny, Jean. Vampires: The World of the Undead. London: Thames & Hudson. 1993. ISBN 0-500-30041-0. McNally, Raymond T. Dracula Was a Woman. McGraw Hill. 1983. ISBN 0-07-045671-2. Schwartz, Howard. Lilith's Cave: Jewish tales of the supernatural. San Francisco: Harper & Row. 1988. ISBN 0-06-250779-6. Skal, David J. The Monster Show: A Cultural History of Horror. New York: Penguin. 1993. ISBN 0-14-024002-0. Skal, David J. V is for Vampire. New York: Plume. 1996. ISBN 0-452-27173-8. Silver, Alain; James Ursini. The Vampire Film: From Nosferatu to Bram Stoker's Dracula. New York: Limelight. 1993. ISBN 0-87910-170-9. Vuković, Milan T. sr:Народни обичаји, веровања и пословице код Срба. Belgrade: Сазвежђа. 2004. ISBN 86-83699-08-0 （塞尔维亚语）. Wilson, Katharina M. The History of the Word "Vampire". Journal of the History of Ideas. Oct–Dec 1985, 46 (4): 577–583. JSTOR 2709546. doi:10.2307/2709546. 尙·馬黎尼（英语：Jean Marigny）. 《吸血鬼：暗夜裡尋找生命》. 發現之旅. 21. 吳岳添/譯. 臺北: 時報文化. 1995. ISBN 957-13-1724-1 （中文（繁體）‎）.